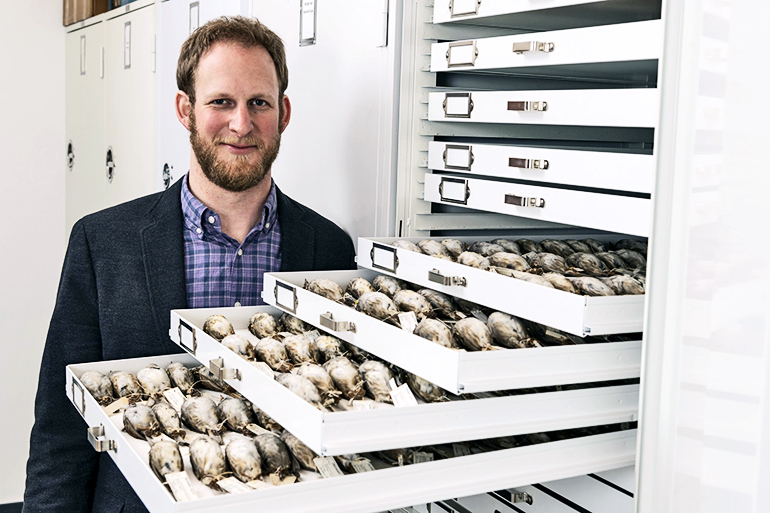 “Nocturnal flight calls likely evolved to facilitate collective decision-making among birds during navigation, but this same social behavior may now exacerbate vulnerability to a widespread anthropogenic disturbance: artificial light from buildings,” says first author Benjamin Winger, an assistant professor in the ecology and evolutionary department at the University of Michigan and an assistant curator at the Museum of Zoology. 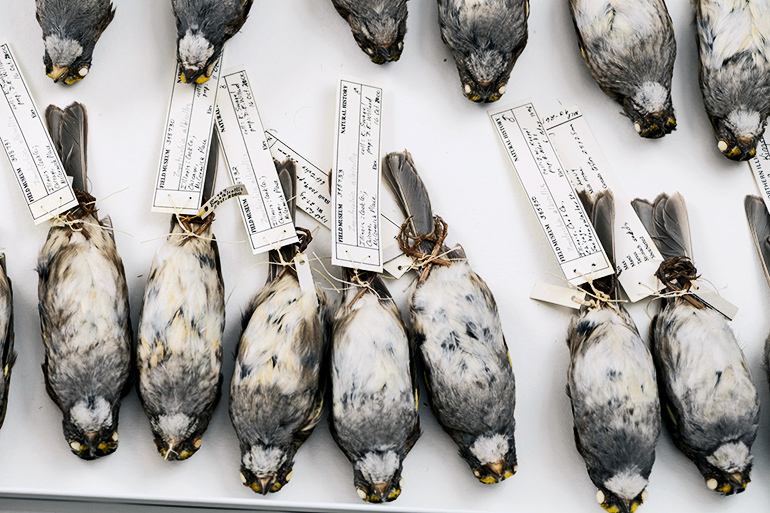 The study relies on bird-collision data Field Museum researchers collected in Chicago starting in 1978 and, more recently, data volunteer groups in Chicago and Cleveland collected. In addition to conducting a broad regional analysis of collision frequencies, the researchers analyzed data from Chicago’s lakefront convention center, which is a hazard to migratory birds. They found that when people left more lights on at night during migration, more birds collided with the convention center and died. “Although the convention center remains one of the most dangerous buildings in Chicago for night-migrating birds, changes in its light regime have resulted in a 75-percent reduction in bird fatalities since I started monitoring in 1978,” says study coauthor David Willard, a retired Field Museum ornithologist who led the data collection in Chicago. Long-distance bird migration is one of the most impressive feats in the animal kingdom. But many bird species migrate at night, which makes direct observation of migrating individuals difficult. Many aspects of these arduous seasonal treks remain shrouded in mystery. When flying at night, many migratory bird species produce short vocalizations known as flight calls. Scientists suspect that these faint, high-frequency calls are signals that help the group with orientation, navigation, and other collective decisions. To investigate the importance of flight calls as social cues for collective decision-making, Winger and his colleagues examined the relationship between flight calling and responses to a highly disruptive stimulus: artificial light at night. Birds and many other types of organisms are drawn toward light sources, a response called a phototaxis. Subsequent nighttime collisions with lighted structures are a major cause of avian mortality. Scientists suspect the glare disorients migrating birds. Birds navigate during migration in part by sensing the Earth’s magnetic field, and some scientists have speculated that artificial light may disrupt a light-sensitive internal magnetic compass. Previous studies have demonstrated that rates of nocturnal flight calls increase when migratory groups fly over brightly lighted cities, as compared to unlit areas, suggesting that the birds react to the light stimulus by vocalizing. In the new study, Winger and his colleagues used existing collision-monitoring data from Chicago and Cleveland to test the influence of flight-calling behavior on nighttime building collision rates. The Chicago collision dataset includes nearly 70,000 records from 93 species, all of them small-bodied songbirds that migrate predominantly at night. These species all breed north of Chicago during the summer and migrate through the region in high numbers. Willard started the monitoring project in 1978. In 2002, the Chicago Bird Collision Monitors, a volunteer network, began collecting collision data throughout downtown Chicago. Collision monitoring began in 2017 in downtown Cleveland, and that dataset is much smaller. “Our paper provides some of the strongest published evidence on the effect of artificial light on bird collisions in urban areas, though this relationship has been known anecdotally for a long time,” says Winger. Several species of sparrow, warbler, and thrush make up the majority of the Chicago collision dataset, with thousands of individuals of each species documented as lethal collisions. These species are known informally to scientists as “super collider” species because of their high collision rates. Researchers compared the collision records with data from the eBird database on the local abundance of various migrating songbird species in Chicago and Cleveland during the spring and fall. Both Chicago and Cleveland are along a major north-south migratory bird flyway. A recent study using satellite data found that illuminated buildings in Chicago collectively expose migrating birds to more artificial light than any other US city. “We hypothesized that if flight calls are important social cues for decision-making during nocturnal migration, individuals from species that make flight calls may attract one another vocally when disoriented by artificial light,” the authors of the new study write. Winger and his colleagues found that all species that were overrepresented in the collision datasets—the super colliders—use flight calls, while all species that do not use flight calls were underrepresented in the collision datasets. They concluded that flight-calling behavior is a significant predictor of collision frequency. The Chicago convention center dataset also showed that, among night-calling migratory bird species, the number of collisions on a given night correlated positively with the amount of artificial light originating from the building. Bird species that do not use flight calls collided less frequently overall, and nighttime light levels at the convention center had no significant effect on their collision counts. “To date, we have not mined the potential information that flight calls could provide to advance our understanding of how nocturnally migrating birds make decisions and orient in difficult situations,” says coauthor Andrew Farnsworth of Cornell University’s Laboratory of Ornithology, who has studied flight calls for decades and provided expert knowledge on which species produce flight calls and which don’t. The study appears in the Proceedings of the Royal Society B. Additional researchers from the University of Michigan, the Cleveland Museum of Natural History, and the Field Museum contributed to the work. The Chicago Bird Collision Monitors and Lights Out Cleveland monitored bird-building collisions and salvaged specimens. Funding for the study came, in part, from the Leon Levy Foundation and the National Science Foundation.